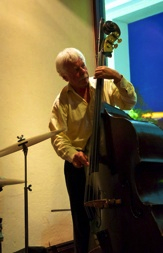 Jack McFadden - Juno award winning double bass player, was born in Hamilton, Ontario, Canada and studied with Joe Gurney in Hamilton, Gurney Titmarsh and Thomas Monohan in Toronto, Warren Benfield in Michigan, and David Holland in New York. Early musical experiences in Hamilton were with Marshall Olchowy, Bruce Harvey, and the late Brian Harris. Jack won a scholarship to the Congress of Strings, in East Lansing, Michigan in a summer many years ago, and moved to Toronto that fall, beginning to work immediately. He won scholarships to the National Youth Orchestra, joined the National Ballet as principal bass for 6 years, and frequently worked in pit-bands for shows at the Royal Alexandra Theatre and O'Keefe Centre. In between tours, he played jazz. He also worked for a few years with the Hamilton Philharmonic Orchestra, sometimes in Windsor, London, Sudbury, Barrie, Kitchener - Waterloo orchestras. Jack also contracted the Toronto Pops Orchestra until its fraudulent downfall. Though not officially a jazz bass player, Jack does enjoy performing the music. He lived in a coach house on Bedford Road for a few years which became famous for all night jam sessions, with many great musicians taking part. When asked where the best music is, Jack always replies, “In the basements”. An early steady job was at the King Edward Hotel with Roy Roberts. For a year, he worked six nights a week with Jimmy Namaro and Gord Carley at the Westbury Hotel. He did a lot of work with leader Harvey Silver in a band that included both Trump and Teddy Davidson. It was a time of many recordings, film scores, and jingles. The drummer Howie Reay was a mentor. Often called a Baroque Specialist, Jack enjoyed working with “The New Chamber Orchestra”, often referred to as the Orchestra of Odessa in Exile. A highlight of that group was the guest conductor, Neville Marriner, before he was "Sir". One gig with that group had Liona Boyd. The concert started a half hour late, the line stretched all the way around the block. He became the contractor of that group for a while.. Te Deum, led by Richard Birney Smith was an employer for 30 years, also with great guests, such as Julianna Baird. I'm still getting chills up my spine from that event. The J.S. Bach Society in St. Catherines was also fun. A brief spell with Tafelmusic at the beginning, Opera Atelier, Aradia, etc. Jack did many shows at the former O’Keefe Centre, thanks to his mentor, Murray Lauder, and the Royal Alex. thanks to Bill Kuinka. We did most of the shows before they went to New York in those days, and touring shows. Gypsy with Angela Lansbury, Oklahoma with Gordon MacRae, Gigi, A Little Night Music, with Jean Simmons, etc. Also, all the shows at Hamilton Place for a few years, thanks to Jim Phillips and Harry Waller. A Big Band specialist, Jack played with the Canadian Tribute to Glenn Miller, the Spitfire Band, recorded with the Al Hirsch Big Band and Whitney Smith’s Big Steam Band. We have just begun a new chapter in big band history, performing with and contracting the Canadian Big Band, based in Southampton, Ontario, featuring some of the greatest Canadian musicians. He recently joined the Orange Devils band. A new band has been formed to work occasional nights at the Barrhead, with Bill Campbell and Seann Burgess. Great Fun. The Barrhead is now closed. Open again. We'll be there on November 3 for a Hallowe'en gig. Now living near Owen Sound, Ontario, he continues to play with local and touring bands, in jazz festivals, and biweekly with a jazz band led by Ted Roberts at a pub in Markham, Rico’s. Finito! He enjoyed performing with a large orchestra at Carnegie Hall in New York. Jack has worked with conductors such as Josef Krips, Lukas Foss, and Neville Marriner, and American jazz greats like Milt Jackson, Chuck Mangione, Thad Jones, Lew Soloff, Gregory Herbert, Mel Tormé, Red Rodney. Some just as great Canadian musicians also. I won't mention all their names, in case I leave one out. My old friend, Bob Fenton, when asked by some audience member whom he had played with, said "Everybody". Jack was fortunate to win a Juno award a few years back, and enjoys helping out with the Georgian Bay symphony with Francois Koh. Some of his favourite work is "church jobs", oratorios with choir, soloists, and small orchestra, like the Cellar Singers of Orillia. Also finito. Recently we started a steady Sunday afternoon gig at Molly Bloom’s in Stratford, with the multi-instrumentalist Merlin Williams, and guest artists. That is finished now. Many years ago, Jack was experimenting with solo bass, kind of free music. He’s hoping to do that again, soon, in public. He lives a quiet life on Townsend Lake, near Markdale, with his two poodles, Mika and Sadie, and 1 hen, Ethel. Jack’s passions include Formula 1, BMWs, bicycling, canoeing, gardening, and cooking. He's preoccupied with building a BMW powered Lotus Seven clone. Incidentally, Jack has two bows for sale, a Louis Morizot, and a Eugene Sartory, an electric bass, a 1966 Fender Precision, and knows of 3 stand up basses close by, for sale. Now accepting hard working students.